This morning I hopped down to Half Moon Bay, a neighboring town on the Pacific coast where I live, to attend the Giant Pumpkin Champion Weigh Off. The back streets of this sleepy farming town were jammed with pick up trucks hauling misshaped giant gourds. By 8 o’clock there was a line of trucks and farmers chatting about their latest tricks to coax poundage from the ground. 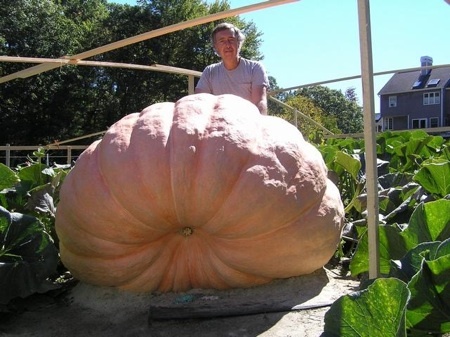 One grower said that on his best day his biggest pumpkin grew 42 pounds in 24 hours. Turns out Half Moon Bay is only one of a hundred or so Weigh Offs around the country, and that backyard Giant Vegetable growing is quite popular. I’m interested in these kinds of subcultures for several reasons. One, I am always fascinated by the extremes of biology. Dwarfs, giants, freaks, monsters all tell us something about the average. In part we come to know something by describing its outer bounds. Where the fringe goes so goes the middle. Our notions of what a vegetable is can be subverted and re-imagined by giant vegetables. At the weigh off this morning no one beat the current world record for a pumpkin. 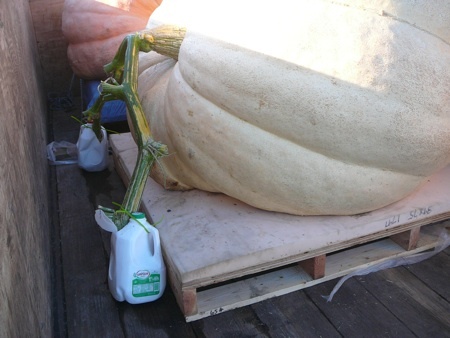 The heaviest pumpkin was 1,524 pounds. That world title was won last month in Massachusetts with a 1,689 pound monster, shown below in its backyard home. 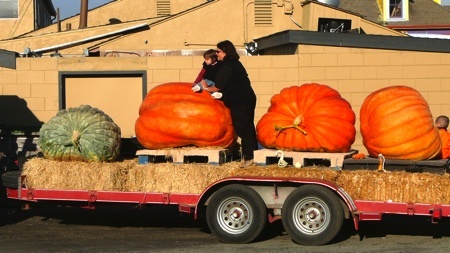 A decade ago, 500 pound pumpkins could win local contests. Pumpkins larger than 1,000 pounds were very rare. Now, as one backyard grower lamented, “1,500 pounds is now the new 1,000. Anything less than 1,000 pounds is not significant.” The record can gain 100 pounds in a year. What this means is that no one knows what the limit is, although there must be a biological limit. We have no idea of how gigantic a Great Pumpkin could theoretically get — and that is thrilling and inspiring. Behind this steady increase in a purely frivolous progress is a large network of enthusiasts. I never tire of the passion of enthusiasts. Even though there are occasional modest cash prizes for winning (today’s winner won $9,144), this is unadulterated amateur love. One guy said, “Look, you have to understand that everyone competing here is insane. We spend up to 3 hours PER DAY tending these giants. Weeding, picking buds, supporting vines, composting. We spend hundreds of dollars on seeds and special pumpkin juice fertilizers which we spray on the leaves hourly. We are nuts!” It is this benign obsessiveness that I thoroughly enjoy submersing into. It is the origins of learning. The general drift of all techniques producing grand results can be summed up as: a stress-free life. From the moment the seed begins to sprout, the job of the grower becomes a nurse-mommy intent on pampering the plant in the extreme so that it never once, not even for a moment, feels stress. The nutrients, water, sunlight, and love have to flow in uninterrupted, so that plant can be all that it can be. The grower has to think like a pumpkin — be the pumpkin. It is that transformation — and not mere competition — that is the great attraction. No matter what the weird hobby, it is always a shock to outsiders what the scarce items will bring. The seeds of a record setting pumpkin can sell for $200 per seed, and as you may remember, there are a lot of seeds in even a small pumpkin. Seeds of pumpkins over 1,000 pounds will be sold at specialty internet suppliers, like Dill’s Atlantic Seed, for $20 per seed, but they sell out fast. Like other niche obsessions, it is fed by the internet. When I asked individuals how they got started in giant rearing, “looking something up on the internet” ranked high in responses. 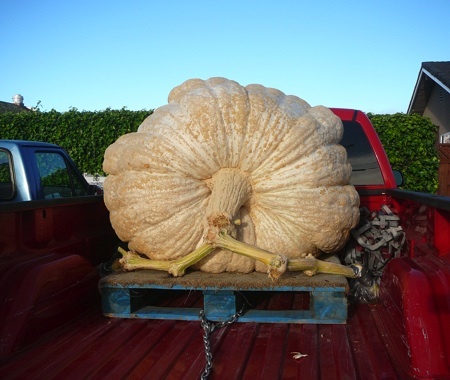 There are local chapters for giant pumpkin growing around the country, but online forums (Giant Vegetable News Network) are easy to find. And then there are The Secrets of Growing Champion Giant Pumpkins DVDs and instructional books (“How-to-Grow World Class Giant Pumpkins III), and tons of internet giant pumpkin how-to sites. One trick all the growers seem to use is to transport their champions with truncated vines plunged into jugs of water to prevent weight loss due to dehydration, as this picture below shows. Nor are pumpkins the only vegetable grown for record size. There are weigh offs for squash and other gourds, and world record producing tomato plants (“How to Grow World Record Tomatoes: A Guinness Champion Reveals His All-Organic Secrets”). The enthusiasm of amateurs is multiplied by a thousand other strange and unfamiliar hobbies, spread far and wide across all fields of interest, from building steam powered toys, to watching for new comets, to whistling. I can’t prove it, but I believe the effort devoted to seemingly non-essential pursuits benefits the intangible wealth of society in a deep and significant way that may equal the benefits of professionals. Listening to what the giant pumpkin growers are learning, I am sure of it. F: 695 Handy M: 801 Stelts. If there is any info. that you could provide for me I would be very ahppy to receive it. I already have 2 other people who want one from me if they start to grow. I do not believe that I will ahve the space for 5 of them to flurish, 2 I could handle. My soil is pure organic and I always place salt marsh hay on the ground of my veg. gardens. Lots of specialists tell that loan aid people to live the way they want, because they can feel free to buy needed things. Moreover, various banks offer bank loan for different classes of people.